Tatjana Chircop (violin), Tricia Dawn Williams (piano) and Lino Pirotta (clarinet) are Equinox Ensemble. 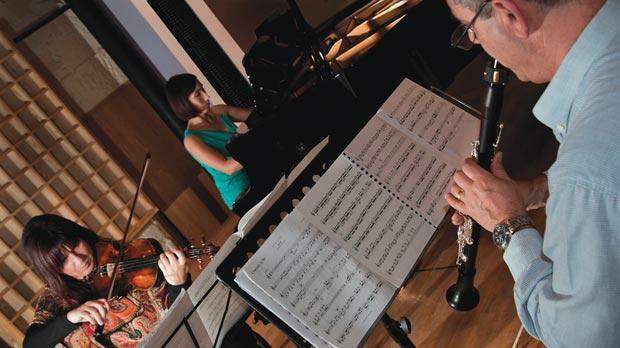 The Equinox Trio – Lino Pirotta (clarinet) Tatjana Chircop (violin) and Tricia Dawn Williams (piano) – specialising in modern and contemporary music recently presented a concert called Modern Songlines of Walkabout at the Music Room, St James Cavalier, Valletta. It was an interesting concert consisting of music created by Maltese and Australian composers, one which showed that music transcends all frontiers and cultures. It also demonstrated that nobody can stop the way forward, even if moving ahead means exploring and referring to our past. That was what Peter Sculthorpe, a well-known Australian composer, had in mind when he composed Dream Tracks, based on melodies used by the aborigines during their walkabouts. These walkabouts are a sort of rite that Australian aboriginal males go through in order to reach maturity. During their long tracks in the wilderness, they sing songlines describing the labyrinths of invisible pathways leading to the creation of all species. The four-section Dream Tracks, written in a modern idiom but based on age-old customs, is quite simple, yet very expressive. It is the clarinet and the violin which introduce the music, the piano joining later leading to a long solo episode by this instrument. A crescendo brings back the violin which, together with the clarinet, works through a plaintive but melodious– although rather agitated – passage followed by long drawn-out phrases recreating the silence of the Bush. The three musicians brought out all the poetry in Sculthorpe’s earthy music, working very well together while playing music that is rarely heard or recorded. The trio’s second choice was very different. It was Charles Camilleri’s New York Trio composed in 1971. After a stirring introduction meant to create the bustling, energetic atmosphere of New York, the individual voices of the three instruments come to the fore with the three musicians playing various cadenzas, bringing the movement to an abrupt end. The second slower movement was more reflective. The clarinet, violin and piano delve into the music of ethnic communities that abound in the city. The violin is given the onus – no problem to our violinist – to introduce jazz which has become synonymous with New York. The third movement was very agitated and restless and the musicians dealt with Camilleri’s musical language efficiently (in spite of the trouble with the clarinet’s reed). The first part of the programme came to an end with Richard Mills’ Four Miniatures. From mysterious, dark atmospheres to toccata-like loud chords from the piano, from tumultuous runs to wry comments, the Four Miniatures captured the audience’s imagination and were well-received. Then it was the turn for Ruben Zahra’s music. I had heard the original version played by Etnika in 2000 but I still enjoyed the arrangement presented by Equinox. Etnika Suite opened with Ħarba, a children’s game of Arabic and oriental provenance, Grinta with the clarinet’s high register and staccato notes to other ballabile, pastoral sections leading to the last rhythmic albeit sarcastic dialogue between the violin and the clarinet. Rive, the last composition, was written in 2002 by Douglas Knehans. It began at a slow and quiet pace creating a melancholic atmosphere. This changed suddenly although the whole work retained its sensitive character. The excellent musicians faced technical difficulties in the music with aplomb, such as the piano’s constant shift in registers and tempos, the clarinet’s timbre and pitch, especially the chalemeau or lowest register and the violinist’s exceedingly fast runs, myriad multiple stops and difficult phrasing. It was not an easy concert, neither for the audience nor for the musicians. However, the difficult choice was faced with confidence and the musician’s ability in addition to their choice of unusual programme is to be praised. We need to expand our horizons. Well done. The trio’s encore was Nisġa by Paul Abela.